After recently returning from our amazing trip to Disney World, we were missing it so much we decided to make a little Disney magic here at home. 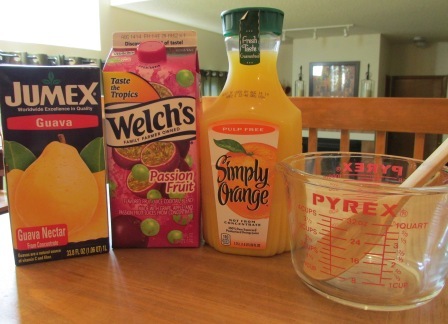 This weekend, we set off on a mission to find the ingredients to make one of our favorite Disney World beverages; Jungle Juice. For those of you not familiar with this tasty concoction, you can typically find it served at the Animal Kingdom Lodge and at several locations throughout the Animal Kingdom Park. On our most recent vacation, we were pleasantly surprised to find they were even serving it at ‘Ohana at the Polynesian Resort! 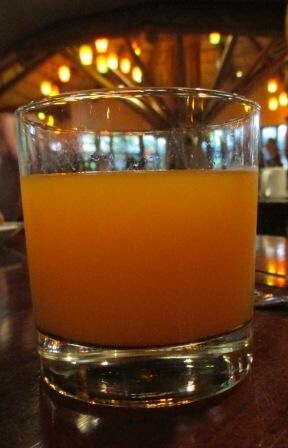 While dining on a yummy Boma breakfast, we confirmed with our server Amin, what goes into the Jungle Juice. He told us that it has changed throughout the years, but the current formula is equal parts orange juice, passion fruit juice and guava juice. Living in one of the least tropical places around (the beautiful state of Colorado), we knew it might be a challenge to find these juices. In spite of this, we needed our Disney fix, so challenge accepted! We checked the fridge and found that we already had a full bottle of orange juice, so we were already a third of the way to our goal! Next, we headed off to Target. We needed to go there anyway to get some Super Soakers (it is summer after all), so we thought we would check out their juice selection. We were amazed to easily find the guava juice. Two down, just one juice to go! 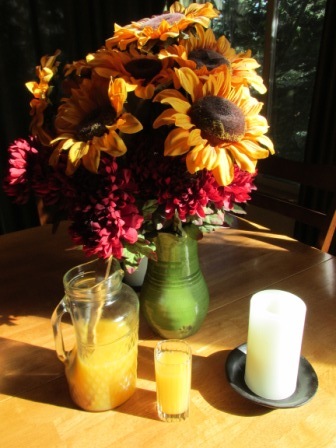 The passion fruit juice proved to be the most difficult. After trying Sprouts with no luck, we decided it was time for a Google search. And what did we find? The all-knowing Google told us that the elusive passion fruit juice could be found in the exotic place called Wal-Mart. So off we went and sure enough in a matter of minutes, we had secured all of our ingredients. As soon as we got home, my hubby quickly mixed it up for us. We were thrilled to find that it tasted just like the real thing! A little taste of Disney right here at home whenever we need it! What about you? Do you love Jungle Juice as much as we do? Please leave a comment! Love Jungle juice! They also have it at Trails End as well but they call it “Moonshine”! So glad I found this! Got home from our amazing trip on December 19 and SO miss that juice! Will head to Target today and mix it up later- I think if I shut my eyes I can almost believe I’m having breakfast at Tusker House again!! Love jungle juice. Cant find real passion fruit juice……i will let u know if i ever do. Oh we do love the jungle juice!!! Glad to hear the home mixed concoction tastes like the real deal! It’s one of the reasons to continue to eat breakfast at Boma.